Magpie and Button: Front Page Feature! 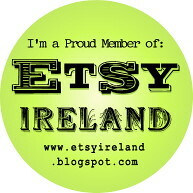 I checked my Etsy page this morning as usual and noticed I have far more hearts than I had yesterday! So I visited craftopolis.com to see if maybe one of my items had been featured in a treasury. I was so surprised to see that TWO items were in treasuries - this Honey Button Ring and also a little button bracelet of mine called Cloudy Skies. So, I thought YAY! Then I realised the treasury that the ring had been featured in had been selected to go on Etsy's FRONT PAGE this morning! Woohoo! It's all very exciting. Thanks to DigitalPerfection for featuring my ring in her pretty pretty treasury, "Kiss Me Honey Honey". Thanks Ruth :) Very exciting indeed, and got lots of views afterward!